In September, Norwegians bought more Tesla Model Ss than any other car – even only 616 were shifted. But it got to the point where the wait list is so long that Teslas are selling for more used than new there. It turns out, though, that it's not necessarily a Tesla-Norway love affair. Reuters reported that the Model S lost its sales crown in Norway last month, but not to the VW Golf again. 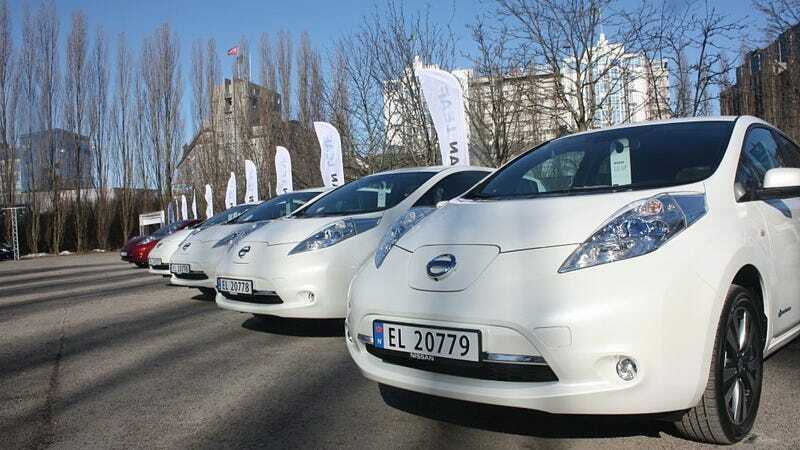 Instead, the Nissan Leaf proved victorious in the sales race with 716 sales. It's also now the country's fourth-best selling car in 2013. The Tesla? Down to a reported 98 units in October, but they're still pricey on the used market based on some ads on FINN.no. Sure, Norway is a tiny market, but EVs have one of the largest market shares there. Tax credits can reach about $8,100, which isn't that much different than what happens in the U.S. But the infrastructure in that small country is catching up to EVs more quickly than it is elsewhere. While EVs and plug-ins in the U.S. that don't say Tesla on them haven't taken off in 2013, they're clearly popular at least in one country. For EV advocates, that's a start, right?